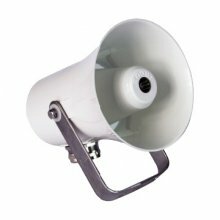 IMCOS-6811 is a watertight horn loudspeaker suited to public address announcement applications. Incorporated stainless steel screws, ensuring a corrosion free product and unit’s weatherproof capability. Type approved by marine class societies: ABS, BV, CCS, DNV, GL, LR, RINA.